One of the many industries Lorenzini thinks will see real benefits from head mounted displays (HMD’s) is medical, especially in the surgical setting. 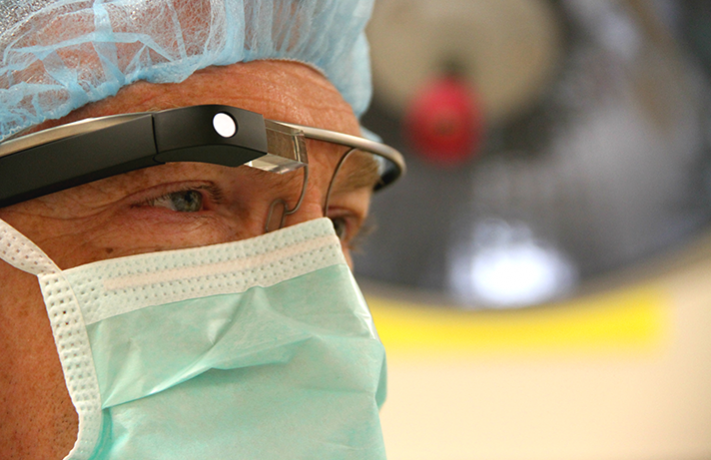 I asked him how Google Glass could work in surgery. But, he also recognizes that Google Glass has some limitations that are barriers for adoption. Always a visionary, Lorenzini imagines a not-to-distant world where we will have to take off our “glasses” to know what is real and what is not, calling that “Perfect (augmented) vision by 20/20.” With new 360° perspective cameras that can help deliver contextual information, working with other sensor based technology, our interaction with the virtual will become more fluid and blend seamlessly with reality. He’s suggesting the time is fast approaching when our virtual and real worlds will merge in ways we have never seen before. “Virtual gaming will be huge driver. Our kids will be playing things like Call of Duty in their living rooms and public spaces. When they put on next generation head mounted displays, it could look like there are virtual zombies trying to bust into the room they’re in.” He believes that virtual characters of all types will soon come to share the space we’re in. Just think about how something like this could benefit patient care within our medical space! Imagine healthcare professionals learning to treat virtual patients within their actual hospital walls, using their actual real-life hospital equipment. In emergency settings, this kind of training could be invaluable. Hospital staff, simulated patients and their simulated caregivers can connect effortlessly in a high-stress augmented environment with millions of scenarios programmed for “on-the-job” learning with minimal risk. This blog was originally posted by Kristi in Razing Standards for LehmanMillet. When I met IMC PR professor Dr. Karen Freberg at Integrate 2014, she brought her Google Glass to the event and I had an opportunity to check it out. Very cool technology and I think is something that can be incorporated into a lot of different professions. The biggest thing will be getting the price of this technology down for a larger market.